This wickedly delightful cookbook features more than 100 recipes contributed by such legendary mystery authors as Sandra Brown, J.A. Jance, Sue Grafton and Mary Higgins Clark. In addition to the recipes, there are full-color illustrations, mischievous sidebars revealing links between food and foul play, and dozens of fun facts, such as lethal plants found in the family garden. Famed English mystery writer Agatha Christie knew a great deal about poisons, using them in the plots of roughly half of her 64 novels. The cookbook’s recipes are divided into seven main sections: Breakfast, Appetizers, Soups & Salads, Entrees, Side Dishes, Desserts and Cocktails. Kate White, former editor in chief at Cosmopolitan and The New York Times’ best-selling author of the Bailey Weggins mystery series, offers insights and facts about major fictional characters. 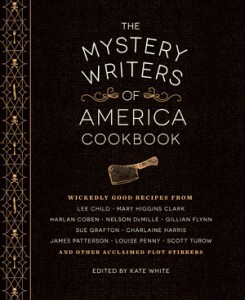 Whether it’s a hard-boiled breakfast, thrilling entree or cozy dessert, no one knows as much about the importance of stomach contents as these illustrious members of the Mystery Writers of America. 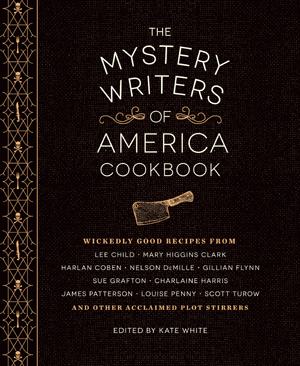 Among the recipes are James Patterson’s Grandma’s Killer Chocolate Cake (a family recipe from the 1940s), Sue Grafton’s Peanut Butter & Pickle Sandwich, Nelson DeMille’s Male Chauvinist Pigs in a Blanket, Alison Gaylin’s Smoking Gun Margarita and, with a nod to Sherlock Holmes, Laurie R. King’s Mrs. Hudson’s Coffee Sheet Cookies. And speaking of coffee, Lee Child serves up a recipe for his perfect cup of coffee for one. Whether you’re planning a sinister dinner party or simply looking to whip up some comfort food, this cunning collection could just be the solution.